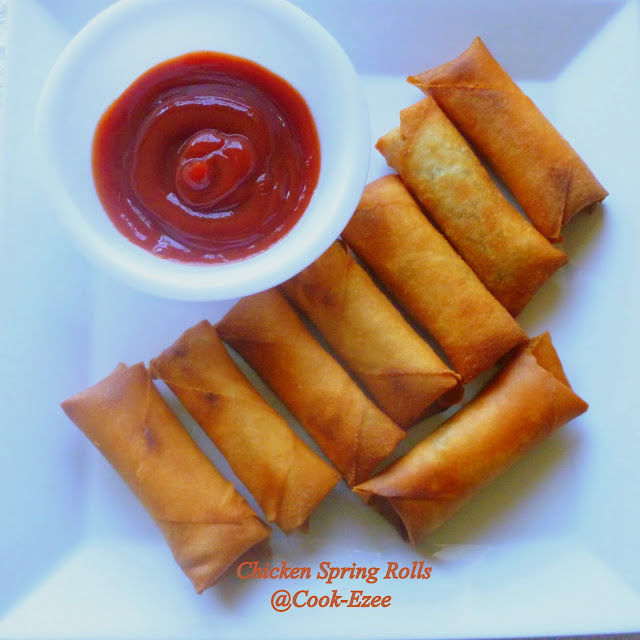 Chicken Spring Rolls is a very popular appetizer or tea time snack. I have used chicken and mixed veggies as the stuffing. 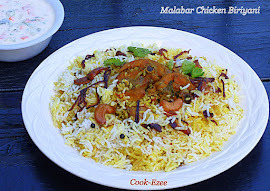 You can use only veggies or scrambled eggs and veggies as per your choice. 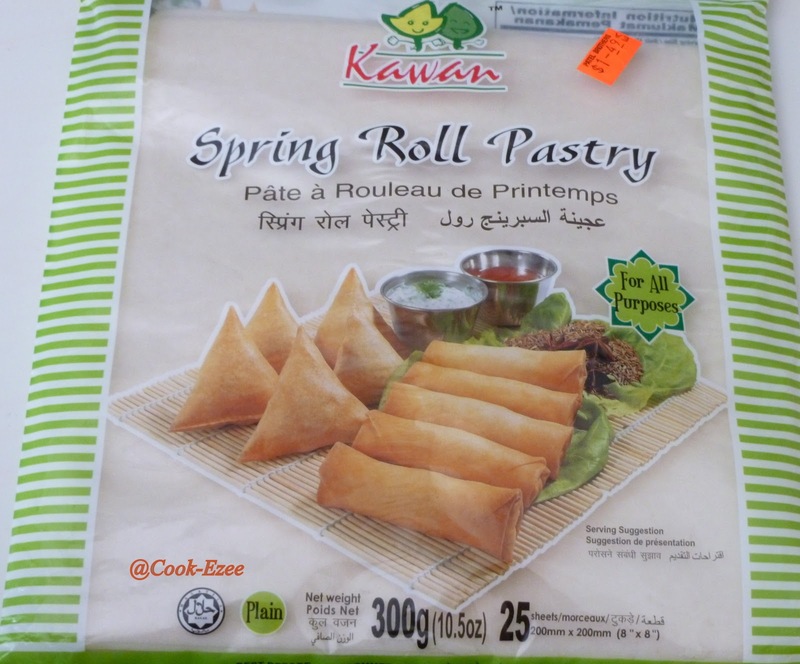 This is a very ezee to make snack/starter if you have the spring roll pastry handy. 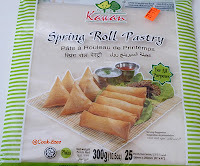 So friends try this out and Enjoy with a cup of hot tea/coffee or as a great appetizer for parties !!!!! 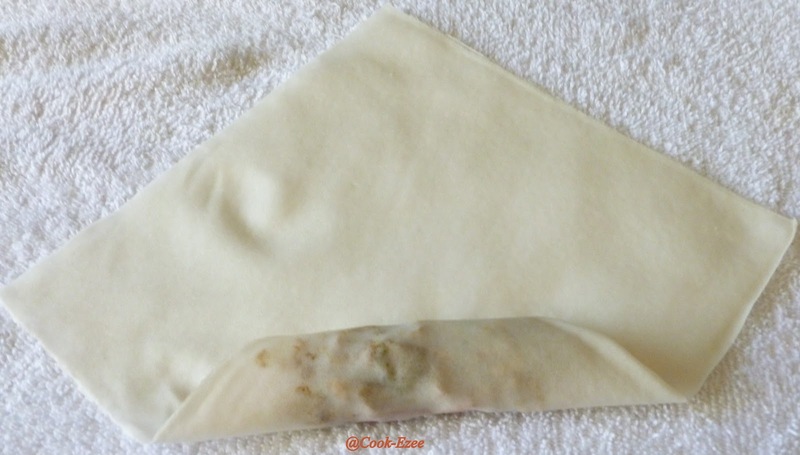 Keep out the spring roll pastry wrappers/sheets 30-40 minutes before use. Finely chop the spring onions into strips and set aside. 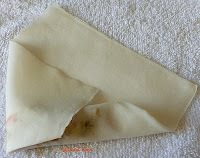 Wash and finely slice all the other veggies and set aside in another bowl. 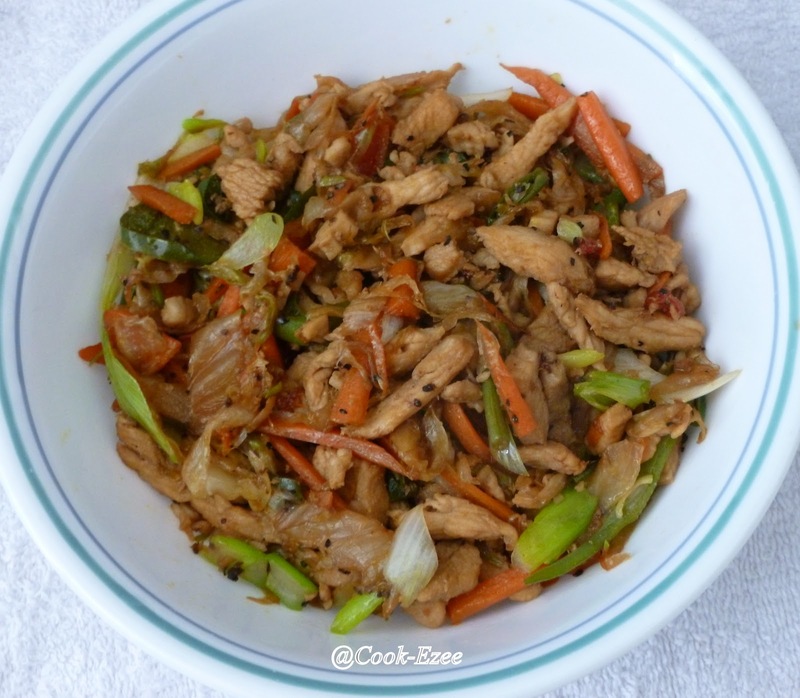 Wash and cut the chicken into strips, sprinkle little bit(1/2 tsp) of salt, toss well and set aside. Heat up a kadai/pan to smoking hot and pour 2 tbsp oil, add in garlic and chicken strips and saute till chicken is almost cooked. Add in all the chopped veggies except spring onion and stir fry for another three-four minutes till all the veggies become crunchy. Add in pepper, soy sauce and salt(if desired) and stir well for another two more minutes or till mixture becomes dry(make sure there is no gravy in the mixture). 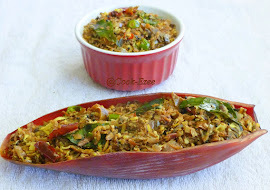 Switch off the stove and add chopped spring onion and saute well to mix. 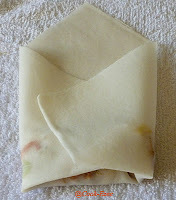 Take out a pastry sheet and keep it diagonally(diamond shape-as shown in the picture). Keep a tbsp of chicken-veggie mixture on one corner, start rolling tightly and folding in the sides as you roll. 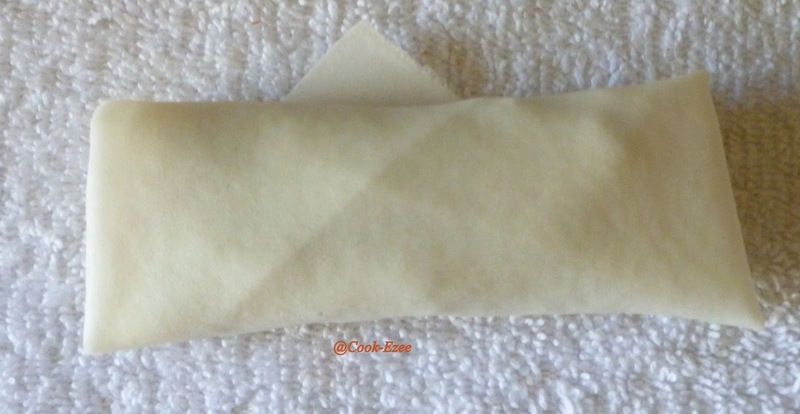 Apply a drop of water on the open edge and seal. Repeat the process with rest of the spring roll sheets. Heat sufficient oil in a kadai/wok on medium heat. Slide the rolls two or three at a time and deep fry till they turn golden brown and crisp. 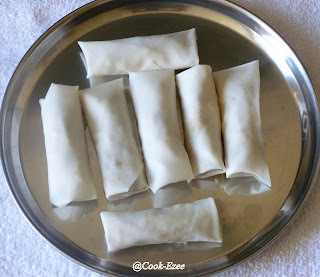 Any time dear :) Btw you can use chopped mushrooms and paneer along with the veggies mentioned here to get perfect veggie version..
Mmmmmm...yummy and perfect spring rolls...looks so tempting!! 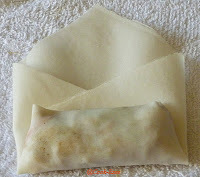 hi,frist time to ur blog....spring roll looks perfect n yummy..im glad to follow u dear. They look so delicious. Perfect tea time snack.. Sounds great! And great presentation too! 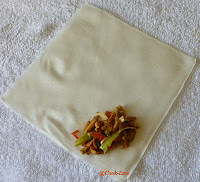 Very delicious n lovely stuffing dear,just like the chinese restaurants serve,Perfect tea time snack!! 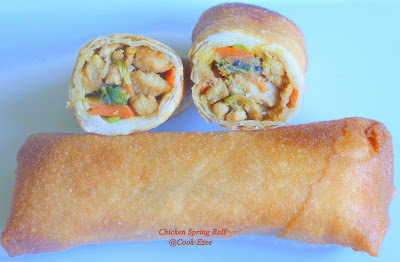 looks so hot n Crispy.....yummy spring rolls...love the pics. Love spring rolls,looks so tempting,perfect snack.